This wearable bass solution packs a serious punch, working well to enhance drum monitoring both on and off the stage. 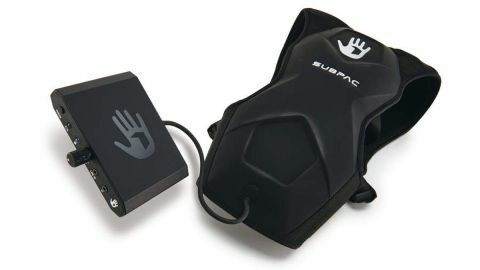 After beginning life as a Kickstarter campaign, the SUBPAC came to market in 2013 as a tool aimed at music producers, allowing them to feel realistic club-bass frequencies whilst working within their own studios. SUBPAC has since expanded into many areas of technology including video games, virtual reality, cinema, fitness and even motoring - it has teamed up with Peugeot to work on a concept car, which includes SUBPAC technology in the seats. More recently the SUBPAC has been presented as a great accompaniment to stage monitoring for performing musicians; the concept has already been embraced by a number of pro drummers. We’ve been sent the freshly-released M2X model to put through its paces behind the kit. Available as a seat-back version or wearable backpack, the SUBPAC uses haptic, proprioception and bone conduction technology to deliver bass frequencies between 1Hz and 200Hz directly to the body. This allows the low-end to be felt rather than just heard. By means of a small module attached to the ’PAC, the signal is sent directly to the unit via the 3.5mm line-in port or wirelessly through the in-built Bluetooth 4.0. The original signal is then sent to headphones through the mini-jack out. This means you still hear the bass frequencies, rather than them being routed exclusively to the SUBPAC. The intensity of the pack can be dialled in via a pot on the module, which works independently from the headphone volume (this can be adjusted from the sound source only). There are limited options for positioning the module so it’s tricky to see the controls without having to remove the pack first. This can prove frustrating during initial setup. The M2X is the third generation of SUBPAC’s wearable model, after the M1 and M2. Identical in appearance to the M2, the latest version boasts an increased dynamic range and over seven hours of battery life - more than enough for even the most gruelling of gigs. The pack has a cool, slimline look and is extremely lightweight at just 5lbs. It’s built to a very high standard and features a combination of hard matte plastic for the main outer section and breathable textile materials for the inside and shoulder straps. The SUBPAC also features a built-in chest strap, and an optional waist strap is included. Also in the box is a charging cable with multiple region adaptors and a mini jack-to-jack cable for the aux-in. The SUBPAC is designed for music, home cinema, VR and gaming too, so we start our testing here before heading to the kit. After listening to some of our favourite tunes by connecting to my smartphone via Bluetooth, we sit down and watch a movie and then indulge in some X-Box. Across the board the SUBPAC performs outstandingly well and never fails to immerse me fully in the moment. We also checked out some ‘SUBPAC optimised’ audio online, which really takes the experience to the next level. Even watching drum videos on YouTube is a whole new ballgame. Now to test it on the drumkit. We tried out the M2X with triggers for a couple of gigs, hooked up through a Roland TM-2 module. This worked wonders at reinforcing the sound of the kick and tom triggers through the connected in-ear monitors, as well as adding a rather satisfyingly low punch through the backpack. Starting with the intensity turned all the way down (off), we set a comfortable listening volume on the headphones and dial in the bass frequencies to our preference. At a moderate listening volume, even half intensity is enough to deliver extreme, gut-punching bass. It feels rather artificial at first but starts to become the norm after a while. The real test is to turn it off whilst playing - it soon becomes apparent how much the SUBPAC is adding. Even with no headphones or monitors connected, the feel alone is enough to greatly enhance the playability of the kit; perfect for drummers who play small gigs where there are no bass bins to be found. Although the SUBPAC works best with all the straps pulled tight for consistent body contact, it does start to feel somewhat restrictive (not to mention a little sweaty) after two hours of straight playing. And depending on your desired style, the backpack look won’t be for everyone. One major benefit of the SUBPAC is that it can pack the equivalent punch of a multitude of sub-woofers with comparably little volume to the outside world. The price tag may seem a little steep, but that money goes a long way when compared to the cost of high-end speakers or even headphones. The SUBPAC will undoubtedly appeal to those practising on e-kits where noise needs to be kept to a minimum. It has amazing applications when mixing drum tracks or other audio too. But while the SUBPAC is described as silent in use, this is not quite the reality. It actually creates a fair rumble, similar to the noise heard when walking past a nightclub. This isn’t a problem for stage use, but in a recording scenario there is the risk of some noise bleed.